After a wildly successful Melbourne run, the most cromulent show you've ever seen is coming to Adelaide for the first time! This gig will be exactly what you think it will be - the greatest time you've ever had. 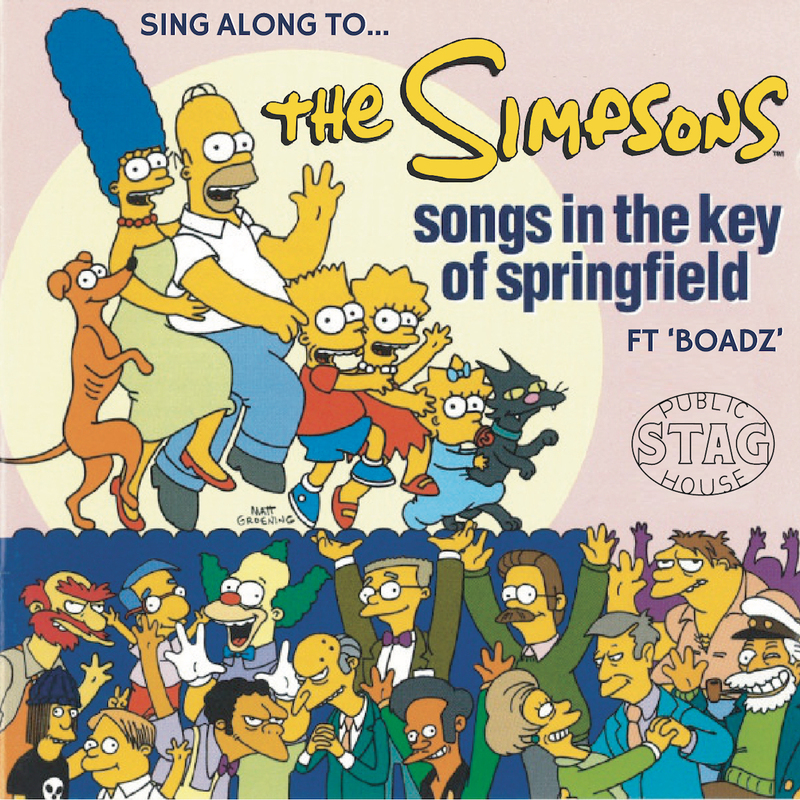 Come out and sing along to all your childhood favourites, from 'See My Vest' to 'We Put the Spring in Springfield'...from 'Who Needs The Quick-E-Mart' to 'Can I Borrow A Feeling? ', all performed live by a legend of the Melbourne music scene, Boadz. There will be prizes for best dressed and best Simpsons merch on the night as well as our own squishies flowing all night long? Doors open at 9:30pm, tunes from 10pm. Thursday the 21st and 28th of February. Tickets available via FringeTix. Do not miss the chance to embiggen your noble spirit! 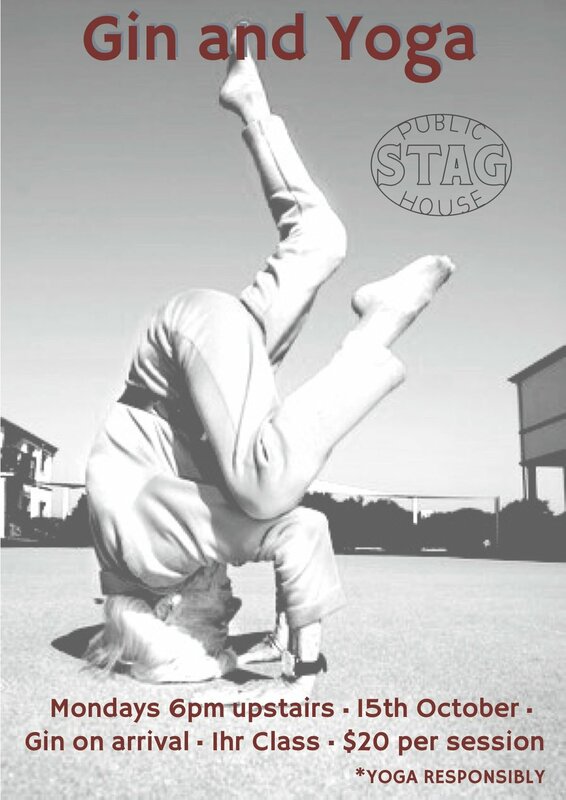 Every Saturday night at the Stag Public House we’re celebrating the Adelaide music scene and hosting some epic gigs. Our upstairs space will be transforming into an intimate band room. Drink, dance and get saucy with us. Nothing screams good times like sipping on some of Australia's best wine while cutting a few shapes to some good old fashioned disco. All while watching the opening night of the Adelaide Fringe unfold from the best balcony in town. So come join us on the opening Friday of the Adelaide Fringe as we dress like Earth Wind and Fire, groove to Donna Summers and learn a bit about a few of the best wineries from around the country. Get in early to meet the people behind the brands and chat to them about the phenomenon that is minimal intervention wines from 6pm to 9pm. Then enter our Boogie Wonderland and get down to Disco DJ’s from 10:00pm. With summer quickly approaching we thought it was the perfect excuse to drink a few Daiquiri's on the balcony and competing in some good old fashion sports. 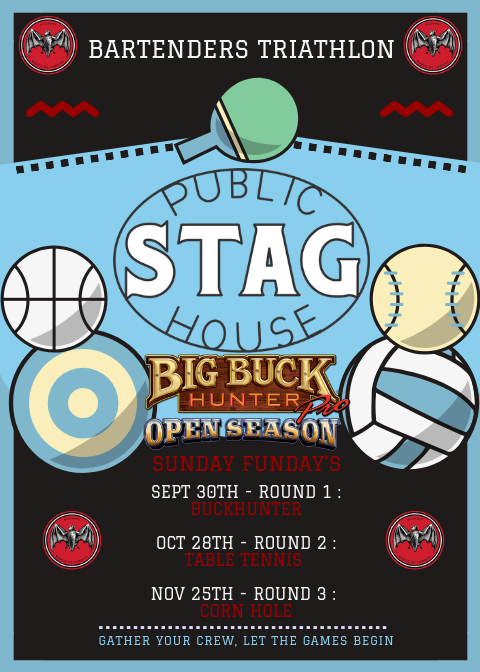 The Stag Public House in collaboration with Bacardi is throwing a three part Hospitality Triathlon. The series is comprised of Buck Hunter, Table Tennis and corn hole and the teams will compete in each discipline with the higher overall point scorers being crowned grand champions of the 2018 Bacardi Spring Hospitality Triathlon. Get together a few of your more competitive compadres and register a team. Spectators are encouraged and everyone will receive a Daiquiri to get things started. Come let your hair down, soak up the sun on the balcony and knock back a Daiquiri or two. Register your teams in the Facebook Event discussion. With weekly prizes, let the games begin! We want to celebrate everything great about local food and booze in fun and quirky ways. This is why our crew here at The Stag Public House is amped to present you with Boozy Balcony Bingo! Form a team and purchase your table online. Play 3x rounds of Bingo with an opportunity each game to win bottles of wine for your team! Love some of the wines you taste throughout the night? We’ll hook you up with the chance to stock up on some at Cellar Door prices! Life is all about balance. Appreciate the simple, yet important things that we often forget about in today's fast paced lifestyle. Start your week with a Gin & Yoga class - opening the body and practicing mindfulness, whilst enjoying your specially crafted gin and tonic. For the next month, we’re teaming up with Adelaide’s champions of Australian music: play / pause / play. Come immerse yourself in everything local! It's time for Stage 2 of the Bartenders Triathlon... Table Tennis! For this next competition we have a VIP Host - brand ambassador and all round legend Peter Holland! In the first leg NOLA took the lead, but who will seize the opportunity and deliver a good ol' fashioned paddling!? To register your team, simply comment the name of your venue in the event thread and then tag your team-mates! Come grab a Mojito, hang out on the Balcony over-looking the Parklands and spur on your team in this integral stage of the Bartenders Triathlon! Come join the team at The Stag Public House and celebrate this classic Aussie race in classic Aussie style; a few fancy bubbles and a couple of beers in between. This is the perfect occasion to soak up the sun on the balcony, enjoy a glass or two Tassies own House of Arras sparkling and celebrate one of Australia’s greatest sporting cultural icon. Prizes for best dressed. Race sweeps and classic Aussie tunes all day. Tickets include food and booze from 12pm – 3pm. $110 per person. Places are limited! 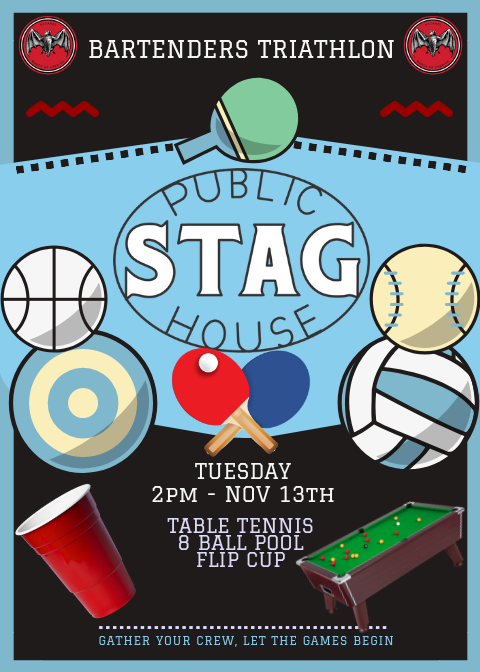 For further information contact functions@thestagpublichouse.com or call 0401 540 935. Grab some mates, a pint and a cob loaf and settle in for the biggest game of the year. It's sure to be a cracker. Coopers have come to the party with a few cheeky prizes so we've come up with some games to help us choose a worthy winner.